This is a question we hear frequently as the weather starts to heat up in late spring and summer. 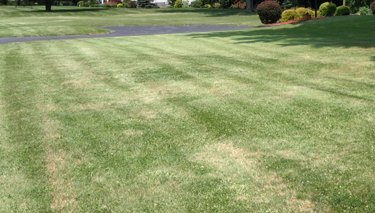 Other than not providing adequate water, mowing lawns too short during the warmer months is one of the biggest reasons we see for lawns turning brown. All grass varieties have an optimal mowing height. This will help keep the lawn healthy and dense. Higher density results in more soil surface shading, will greatly limit the germination of many annual grassy and broadleaf weeds, and will reduce how quickly the soil dries out. Maintaining a dense and healthy lawn is the best weed control! In the San Jose area the type of lawn we run across most often is fescue. The mowing height range for Tall Fescue is 2.0 – 4.0 inches. The optimal mowing height is around 2.5 inches. You should try to achieve a mowed height in this range without cutting more than 1/3 of the blade height during any one mowing.